I’m a retired pipefitter. I worked with the United Association of Plumbers and Pipefitters Local 412 for many years. And I’m a Democrat. I graduated Santa Fe High and attended the University of New Mexico before I went to work with the family business, Valdez Plumbing and Heating. I entered a 5-year apprenticeship program with the union, and earned my Journeyman certificate and State of NM Journeyman Pipefitter & Plumbing & Gas License. I was employed by Valdez Plumbing and Heating before setting out to work at the San Juan Power Plant in Farmington NM. I then worked for Zia Contractors at Los Alamos National Laboratories until my retirement in 2014. 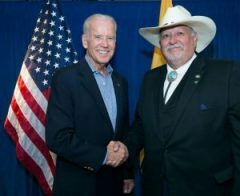 Mike Archuleta and Vice President Joe Biden. I’m a member of the Democratic National Committee, the Democratic Party State Central Committee, Santa Fe County Democratic Party, and the New Mexico Federation of Democratic Women in Santa Fe. I am a member of the International Association of Plumbing and Mechanical Officials and serve as trustee and delegate of the Northern New Mexico Central Labor Council. I’m Vice President of UA Local 412 where I also have the honor of serving as Special Representative in charge of the Executive Board and Political Education Committee. 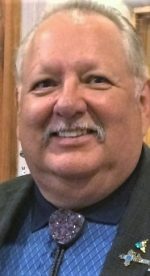 I have served as Chair of the Santa Fe County Democratic Party and since 2006 have worked on many political campaigns, including Henry Valdez for District Attorney. I’ve had some experiences and I’ve learned a few things about strong organizations, effective leadership, and politics. And I can tell you that I am proud to be part of the Santa Fe Democratic Party/Leaders Who Listen team, and look forward to working with our excellent slate: Susan Popovich – Chair; Katherine Clark – Treasurer; Margaret Romero – Secretary. Mike and Senator Tom Udall. 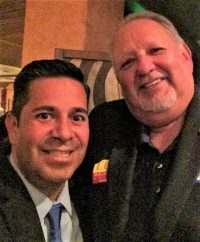 Mike with Congressman Ben Ray Lujan. 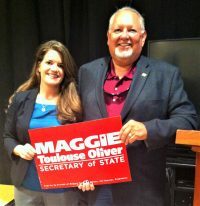 Campaigning with Secretary of State Maggie Toulouse Oliver.